This is not your regular bakers twine! Divine Twine took great care in creating their eco-luxe Divine Twine™. It's made from 100% cotton so it's soft to the touch, bio-degradable and earth-friendly. Plus the 4-ply construction makes it nice and strong. It's produced in the USA in mouth-watering colors that look good enough to eat. Each spool contains 240 yards, enough to last a long time, yet easy to store. More Divine Twine bakers twine = more fun! Unleash your creativity! 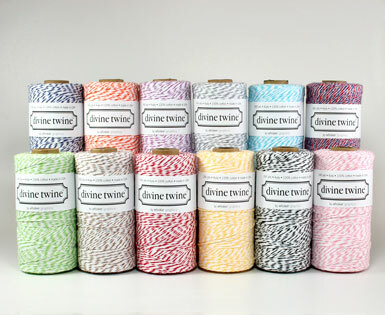 Divine Twine is also available as wholesale.